Arquette was born in Chicago, Illinois, in 1968 to Lewis Arquette, an actor, and Brenda Olivia "Mardi" (née Nowak), who was involved in the arts and worked as a therapist. Through her father, Patricia is distantly related to explorer Meriwether Lewis. Arquette's father had converted from Catholicism to Islam. Arquette's mother was Jewish, and her ancestors emigrated from Poland and Russia. Her father's family's surname was originally "Arcouet", and his paternal line was of French-Canadian descent. Her paternal grandfather was comedian Cliff Arquette. Patricia's siblings also became actors: Rosanna, Richmond, Alexis, and David. When she was a child, her parents offered to get her braces for her teeth; but she refused, telling them she wanted to have flaws because it would help her with character acting. For a time her family lived on a commune in rural Bentonville, Virginia. She has said they became poorer the longer they lived there and she believes that experience enlarged her empathy. Their father was an alcoholic, and their mother violently abusive. When Arquette was seven, the family relocated to Chicago. They later settled in Los Angeles, California. Arquette grew up Catholic and attended Catholic school, and has said that when she was a teenager, she had wanted to be a nun. At the age of fourteen, Arquette ran away from home after learning her father was having an affair—she settled with her sister, Rosanna Arquette, in Los Angeles. She has described her father as a working actor for industrial films, commercials and voiceovers – he was best known for his role as J.D. Pickett in the TV series The Waltons. Before pursuing a career in acting, Arquette had wanted to be a midwife. She put this career prospect aside briefly in an attempt to gain acting jobs and gained success in the industry. In 1987, Arquette's first starring roles included pregnant teenager Stacy in the television film Daddy, boarding school student Zero in Pretty Smart, and Kristen Parker in A Nightmare on Elm Street 3: Dream Warriors, alongside Robert Englund as Freddy Krueger and Heather Langenkamp as Nancy Thompson. She reprised her role as Kristen in the music video to Dokken's Dream Warriors (1987). She was asked to reprise her role in the sequel, A Nightmare on Elm Street 4: The Dream Master (1988), but she declined the offer in order to do other projects. She gave up the role of Tralala in Last Exit to Brooklyn due to her pregnancy with her son Enzo. They asked me to come back for 4 but at that time I was starting to break into kind of meatier roles. I had just done a movie of the week about teen pregnancy called Daddy and I was really liking getting deeper with my work. I love the horror genre and the Freddy franchise but I was chomping at the bit to try other things as an actor. —Arquette on why she didn't reprise her role as Kristen Parker in A Nightmare on Elm Street 4: The Dream Master (1988). In her early career, Arquette received the most recognition for her role as Alabama Whitman, a free-spirited, kind-hearted prostitute in Tony Scott's True Romance (1993). The film was a moderate box office success but became a cultural landmark because of Quentin Tarantino's screenplay, which preceded Pulp Fiction, although some critics were deterred by the graphic violence. In one scene, Arquette puts up a fierce physical struggle in a fight with James Gandolfini (as a viciously sadistic killer) which her character ultimately wins. Arquette's performance received generally unanimous praise from critics. Janet Maslin of The New York Times premarked that Arquette played her role with "surprising sweetness", while Peter Travers remarked that "Arquette delivers sensationally". TV Guide noted that the film blends and recycles elements from the story of Bonnie and Clyde and Terrence Malick's "love on the run" film Badlands (1973). It gave True Romance overall a favourable review for having "enough energy and verve to create something entirely fresh and infectiously entertaining". Richard Corliss of Time Magazine made similar statements and also likened the film to the earlier, seminal Bonnie and Clyde. Arquette appeared in three films in 1996, the first the comedy film Flirting with Disaster (1996), about a young man's cross-country pursuit to find his parents. Critical reception was largely positive, with Todd McCarthy of Variety praising the film and the authenticity of Arquette's performance, highlighting that "Arquette [is] very believably distracted and infuriated". Flirting with Disaster grossed $14 million at the American box office and was screened in the Un Certain Regard section at the 1996 Cannes Film Festival. Her second film released that year was the period drama The Secret Agent, an adaptation of Joseph Conrad's 1907 novel of the same name. The film received average reviews. Infinity was her third film that year, a biographical drama about the early life of American physicist Richard Feynman. The film received mixed to positive reviews. Although Emmanuel Levy of Variety said that Arquette was "miscast", he stated that she "registers more credibly in the first part of the film, when she plays an adolescent". 1998 saw Arquette perform in two films: Goodbye Lover, a comedic neo-noir directed by Roland Joffé and The Hi-Lo Country, a period Western directed by Stephen Frears. The former received a poor critical reception while the latter received a more appreciative albeit modest response. The Hi-Lo Country was widely cited as a "classic Western" in the press. Stephen Holden of the New York Times said, "In its best moments the movie feels like an epic hybrid of Red River and The Last Picture Show." In 1999, Arquette returned to familiar territory with the genre that began her career, in Stigmata, a horror film, in the lead role. Produced on a budget of $29 million, the film was a box office success, grossing $50,046,268. Internationally the film earned $39,400,000 for a total worldwide gross $89,446,268. Critics were not as receptive of the film as audiences, with Roger Ebert remarking "possibly the funniest movie ever made about Catholicism — from a theological point of view". Arquette then appeared in Martin Scorsese's Bringing out the Dead, based on the novel by Joe Connelly. The film united her with then-husband Nicolas Cage and received highly favourable critical reviews, but was a box office flop. Janet Maslin of the New York Times wrote that "Arquette's quietly credible performance helps center Frank's experiences; one of the film's most honest scenes is one in which they share an ambulance ride without sharing a word". In early 2015, Arquette began starring in the CBS series CSI: Cyber, a show about FBI agents who combat Internet-based crimes. On May 12, 2016, CBS canceled the series after two seasons, thus ending the CSI franchise. In 2018, it was announced that Arquette would be starring in the Hulu series The Act. She portrayed Tilly Mitchell in the Showtime miniseries Escape at Dannemora, which premiered on November 18, 2018. For the role, she gained weight, wore prosthetic teeth, and brown contact lenses. At age 20, Arquette had a relationship with Paul Rossi, a musician. They had a son together, Enzo Rossi, born on January 3, 1989. Arquette and actor Thomas Jane became engaged in 2002. Their daughter Harlow Olivia Calliope Jane was born on February 23, 2003. Arquette and Jane married on June 25, 2006, at the Palazzo Contarini in Venice, Italy. In January 2009, Arquette filed for divorce from Jane on the grounds of irreconcilable differences, but the couple soon reconciled. Arquette withdrew the divorce petition on July 9, 2009. On August 13, 2010, Jane's representative announced that Arquette and Jane had decided to proceed with a divorce due to "irreconcilable differences". The divorce was finalized on July 1, 2011, and the two agreed to joint custody of their child. In April 2010, she teamed up with welding students of the Robert Morgan Educational Center in Miami, Florida, to build shelters in Haiti from 20 used shipping containers, to provide housing to people displaced by the earthquake. The Outsiders Rhonda Sue Episode: "The Stork Club"
^ "Patricia Arquette". TVGuide.com. Retrieved May 3, 2014. ^ Sumner, Jane (October 10, 2015). "Arquette prepares a passionate plea for equality at Austin event". Austin American-Statesman. Retrieved June 23, 2018. 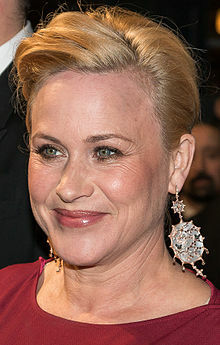 ^ a b "Patricia Arquette Biography (1968–)". Filmreference.com. Retrieved October 11, 2011. ^ Elkin, Michael (October 6, 2005). "'Medium' Cool … and Trailing Sparks". jewishexponent.com. Archived from the original on May 24, 2013. Retrieved April 1, 2013. ^ a b Hoggard, Liz (August 18, 2006). "Patricia Arquette: The not-so-dippy hippie". The Independent. Retrieved May 23, 2018. ^ "Patricia Arquette's Early Life on a Virginia Commune". The Wall Street Journal. December 12, 2017. Retrieved May 23, 2018. my father, who was raised a Catholic, converted to Islam. My mom was Jewish, but my dad’s conversion was never a source of friction. ^ Smith, Dinitia (August 20, 1995). "None of That Sultry Innocence For a Change". The New York Times. Retrieved May 24, 2018. ^ Bussmann, Kate (February 9, 2015). "Patricia Arquette interview: on Boyhood, Nicolas Cage and growing up". The Daily Telegraph. Retrieved May 23, 2018. ^ Pfefferman, Naomi (February 17, 2010). "David Arquette: The Females of My Life". The Jewish Journal of Greater Los Angeles. Retrieved May 23, 2018. ^ Pfefferman, Naomi (October 17, 2002). "Arquette Reconnects". The Jewish Journal of Greater Los Angeles. Retrieved May 24, 2018. ^ Vallance, Tom (February 16, 2001). "Lewis Arquette – Obituaries". The Independent. London. Archived from the original on October 26, 2010. Retrieved April 1, 2013. ^ "Patricia Arquette – Cranky Critic® StarTalk – Movie Star Interviews". Crankycritic.com. Archived from the original on September 27, 2011. Retrieved October 11, 2011. ^ "Arquettes". Archived from the original on June 29, 2012. Retrieved February 25, 2015. ^ "Patricia Arquette calls her 12 year Boyhood experience an anti-movie". hitflix.com. Retrieved February 25, 2015. ^ a b "Patricia and Rosanna Arquette's Childhood Memories". Oprah.com. Retrieved August 4, 2015. ^ "Thursday Interview: Patricia Arquette". November 16, 2000. Retrieved July 30, 2017. ^ Patricia Arquette interview on Charlie Rose (1999). PBS and Charlie Rose Inc. 1999. ^ "Patricia Arquette Filmography". Fandango.com. Retrieved October 11, 2011. ^ "Interview: Patricia Arquette talks Dream Warriors". Bloody Flicks. November 4, 2017. ^ a b Harmetz, Aljean (September 19, 1993). "Up and Coming - Patricia Arquette - She's the Embodiment Of the Spacey Flower Child". The New York Times. Retrieved February 25, 2015. ^ Travers, Peter (September 10, 1993). "True Romance". Retrieved February 25, 2015. ^ "True Romance Review". TV Guide. Retrieved February 25, 2015. ^ Corliss, Richard (September 13, 1993). "Goons Go Gun Crazy". Time. Retrieved February 25, 2015. ^ "Festival de Cannes: Beyond Rangoon". festival-cannes.com. Retrieved September 2, 2009. ^ Sragow, Michael. "Beyond Rangoon". The New Yorker. Retrieved February 25, 2015. ^ Hinson, Hal (August 25, 1995). "Beyond Rangoon". The Washington Post. Retrieved February 25, 2015. ^ McCarthy, Todd (March 18, 1996). "Flirting with Disaster". Variety. Retrieved February 25, 2015. ^ "Festival de Cannes: Flirting with Disaster". Festival-Cannes.com. Retrieved September 20, 2009. ^ "The Secret Agent". Rotten Tomatoes. Retrieved February 25, 2015. ^ "Infinity". Rotten Tomatoes. Retrieved February 25, 2015. ^ Levy, Emanuel (September 16, 1996). "Infinity". Variety. Retrieved February 25, 2015. ^ Ebert, Roger (February 27, 1997). "Lost Highway". rogerebert.com. Retrieved February 25, 2015. ^ Klein, Andy (February 27, 1997). "A bumpy ride". Dallas Observer. ^ Sragow, Michael. "Lost Highway". Archived from the original on January 7, 2006. Retrieved February 25, 2015. ^ Guthman, Edward (February 28, 1997). "Lost Highway travels a weird route". San Francisco Chronicle. ^ "Nightwatch - Box Office Data". The Numbers. Retrieved July 25, 2011. ^ "Nightwatch". Rotten Tomatoes. Retrieved February 25, 2015. ^ Champlin, Charles (January 1, 1999). "Max Evans: Lone Writer of The Hi-Lo Country". Los Angeles Times. ^ Holden, Stephen (December 30, 1998). "Hi-Lo Country: Even Cowboys Get the Blues". The New York Times. Retrieved February 25, 2015. ^ "Stigmata". Box Office Mojo. ^ Ebert, Roger (January 1, 1999). "Stigmata". RogerEbert.com. ^ Washburn, Lindy (February 27, 2000). "To Hell And Back in an Ambulance – Author Chronicles A Medic's Wild Ride Between Death And Saving Lives". The Record. Bergen County, New Jersey. Archived from the original on November 2, 2012. Retrieved January 25, 2010. ^ McClurg, Jocelyn (March 1, 1998). "'Bringing Out The Dead' Vivid, Out Of Control". Hartford Courant. Hartford, Connecticut. p. G.2. Retrieved January 25, 2010. ^ Maslin, Janet (October 22, 1999). "Bringing out The Dead". The New York Times. Retrieved February 25, 2015. ^ "Little Nicky (2000)". Rotten Tomatoes. Retrieved August 24, 2010. ^ "Festival de Cannes: Human Nature". festival-cannes.com. Retrieved October 24, 2009. ^ "Human Nature". rogerebert.suntimes.com. 2001. Retrieved January 27, 2011. ^ "Weekend Box Office Results for April 18-20, 2003". Box Office Mojo. April 21, 2003. Retrieved March 24, 2013. ^ Rabin, Nathan. "It's Only The Size Of Your Heart That Counts Case File #154: Tiptoes". A.V. Club. Retrieved February 25, 2015. ^ Travers, Peter (November 13, 2006). "Fast Food Nation: Review". Rolling Stone. Archived from the original on September 7, 2009. Retrieved September 7, 2009. ^ Scott, A. O. (November 17, 2006). "Fast Food Nation (2006)". The New York Times. Retrieved September 7, 2009. ^ "92.5 KJJY". Kjjy.com. March 20, 2011. Archived from the original on October 1, 2011. Retrieved October 11, 2011. ^ "A Single Woman". Rotten Tomatoes. Retrieved February 25, 2015. ^ "Girl In Progress". Rotten Tomatoes. Retrieved February 25, 2015. ^ Hornaday, Ann (July 17, 2014). "Richard Linklater's audacious, epic cinematic journey". The Washington Post. Retrieved July 20, 2014. ^ LaSalle, Mick (July 17, 2014). "Linklater changes the game". San Francisco Chronicle. Retrieved July 20, 2014. ^ Dargis, Manohla (July 10, 2014). "Linklater's 'Boyhood' is a model of cinematic realism". The New York Times. Retrieved July 20, 2014. ^ "Richard Linklater's 12-year masterpiece". Salon. Retrieved July 20, 2014. ^ "Boyhood a remarkable story spanning 12 years". The Arizona Republic. July 17, 2014. Retrieved July 20, 2014. ^ "Patricia Arquette wins the Oscar for "aging gracefully" — oh, and for her performance in "Boyhood"". Salon. February 23, 2015. Retrieved February 25, 2015. ^ "Boyhood". At the Movies (ABC Australia). August 26, 2014. Retrieved February 25, 2015. ^ Abrams, Natalie (January 17, 2015). "Patricia Arquette Returning to 'CSI' before 'CSI: Cyber' Kicks Off". Entertainment Weekly. ^ Andreev, Nellie (May 12, 2016). "CSI: Cyber Canceled By CBS After 2 Seasons". Deadline Hollywood. Retrieved May 12, 2016. ^ Andreeva, Nellie (2018-09-05). "Patricia Arquette To Star In Hulu True-Crime Anthology Series 'The Act'". Deadline. Retrieved 2018-10-01. ^ O'Connell, Michael (16 November 2018). "Patricia Arquette, 'Escape at Dannemora' and Her Year of "Complicated Monster Women"". Hollywood Reporter. Retrieved 17 December 2018. ^ "Actress Patricia Arquette weds in Italy". usatoday.com. Associated Press. June 27, 2006. Retrieved April 1, 2013. ^ Wolk, Josh (February 25, 2000). "Reality Bites". Entertainment Weekly. ^ "Patricia Arquette splits from Hung star husband Thomas Jane after reconciliation fails". London: dailymail.co.uk. August 14, 2010. Retrieved April 1, 2013. ^ Greenblatt, Leah (July 7, 2006). "Celebrity news for the week of July 14, 2006". ew.com. Retrieved April 1, 2013. ^ "Arquette's Romance No Longer True". TMZ.com. May 1, 2005. Retrieved October 11, 2010. ^ "Patricia Arquette and Thomas Jane Are Canceling Their Divorce". Stars Journal. Archived from the original on October 8, 2011. Retrieved October 11, 2011. ^ "Patricia Arquette, Thomas Jane – Divorce Final". TMZ.com. July 7, 2011. Retrieved October 11, 2010. ^ "GiveLove.org". Retrieved February 25, 2015. ^ "Patricia Arquette Gives Charity Love To The Homeless In Haiti". Looktothestars.org. Retrieved October 11, 2011. ^ "Patricia Arquette's Charity Work, Events and Causes". Looktothestars.org. Retrieved October 11, 2011. ^ "Patricia Arquette - Awards - IMDb". IMDb. Retrieved January 7, 2019.